Coban, Guatemala, October 2012. From left to right: Ingrid Paola Santa María Morales (Central America Administrative & Finance Officer), Michael Felix (Central America Program Director), Penny Foley (Board Chair), Bill Abrams (President), Jorge Coy (Central America Regional Representative). With this 2012 annual report, we are making two major changes in how we report to you about Trickle Up. We hope that both give you greater insight into our work, accomplishments, and challenges. The first change is to make our traditional annual report Web-based, eliminating the printed edition that you have received in the past, helping us save money and trees. The second change is our new Impact Report, scheduled for publication later in February 2013. As an organization deeply committed to rigorous program monitoring and evaluation, this report will present a series of statistical snapshots that demonstrate the impacts that our participants are making in their lives as well as in their communities. Scaling our impact: In June, our board approved a new three-year strategic plan that we think is the most important road map for Trickle Up since Glen and Mildred Robbins Leet founded Trickle Up in 1979. We began our strategic thinking process with one central question: How do we scale our impact? We take enormous pride in the tens of thousands of lives we touch every year, but we also know that the need for Trickle Up extends to hundreds of millions of people in dozens of countries. Central to our long-range thinking was identifying the skills, experience, and knowledge that make Trickle Up unique among the thousands of international, national, and local organizations addressing global poverty. Our planning process tapped the perspectives of our staff at headquarters and three field offices, our board, the distinguished experts on our Advisory Council, and other leading thinkers in our field. Our strategic plan expands the ways in which we will pursue our mission. In addition to continuing to serve people in some of the poorest villages in the world, as we and our local partners have always done, we are establishing a new way of expanding Trickle Up's mission by providing technical assistance to governments and institutions also dedicated to serving the poorest people. 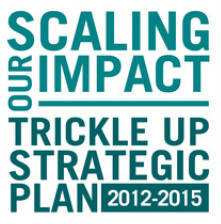 To read the new Trickle Up strategic plan, click here. To establish this new avenue for expanding Trickle Up’s reach, we have formed a partnership with the BRAC Development Institute (BDI) in Bangladesh. BRAC, a highly respected poverty alleviation organization, has developed a highly successful livelihood program for people living in ultrapoverty that serves as the model for many programs like Trickle Up’s. 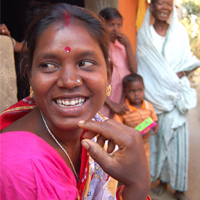 BDI is a research institute connected with BRAC and has evaluated a number of projects focused on economic development for families living in ultrapoverty. Together, BDI and Trickle Up will use our experience and that of other institutions working within the CGAP-Ford Foundation graduation consortium, to support organizations that seek to serve ultrapoor families. Within the next few months, we expect to begin technical assistance projects in at least two countries in Africa, and have promising conversations underway on other similar projects. Adapting the Trickle Up model: Over the past few years in India, we have made a series of changes and innovations to our traditional model. We applied new selection methods to ensure that we were reaching the ultrapoor, extended the length of our program from one to up to three years, increased the size of our seed capital grants from $100 to an average $235 to meet the capital requirements of Trickle Up businesses, and made other changes designed to increase the effectiveness and sustainability of our program. Based on the results of a carefully structured pilot program, we have adopted this approach throughout India and are now applying our learning to our programs in Central America and West Africa. A highlight of 2012 was the award of a three-year grant from the Ford Foundation to help us scale our new approach, both by increasing the size of our India program and showcasing our work to practitioners, policymakers, and funders in India. Ford’s support is an important endorsement of Trickle Up’s approach and effectiveness. Another important area for innovation has been our work with people with disabilities. Trickle Up has responded to the high correlation between disability and extreme poverty with special outreach to this population and methods that adapt our traditional program to their needs. Our work has been recognized by leaders in the field, and we have received a major grant from USAID to apply the Trickle Up methodology for people with disabilities in Guatemala. 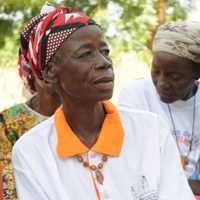 Responding to challenges: In March 2012, a coup in Mali left a power vacuum that has deeply affected the families with whom we work and our program in Mali. Extreme poverty often occurs in areas in which governments are weak and cannot deliver basic services, and in this case, could not even maintain its territory. As armed groups took control of northern Mali, affecting about 40 percent of the people in our program, security risk made it impossible for us to continue in that area. As a result of the unrest, USAID suspended its funding for Trickle Up’s Mali program. With 80 percent of our Mali funding coming from USAID, we were forced to suspend our operations there. Suspending operations in Mali was a difficult decision, given our longstanding commitment to the participants, partners, and staff there. 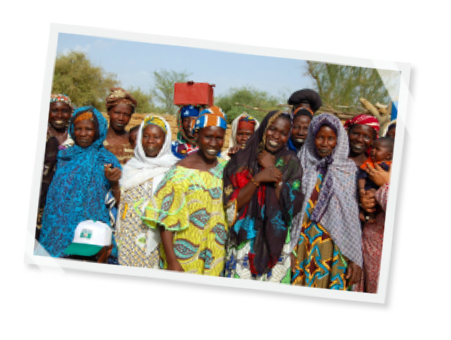 However, it is important to note that over the past eight years, we have helped more than 25,000 Malian women start businesses, save regularly, and gain skills and confidence. With each Trickle Up enterprise benefiting an average of five people, we have touched more than 125,000 lives there during that period, and we hope to resume our work there when security conditions and funding permit. In the meantime, we believe that the training and capital we have provided, plus more than 1,000 savings groups that we helped form, will give people skills and resilience that can help them cope in this very challenging time. We remain committed to West Africa and this year established a field office in Burkina Faso, where we have worked for many years with management from our Mali team. One of the world’s poorest nations, ranking 181 of the 187 countries in the UN Human Development Index, Burkina Faso continues to be an important country for Trickle Up’s work, and we plan to expand our program there in the coming years. Fulfilling our mission, every day: In 2012, we helped 7,558 people in West Africa, India, and Central America start their families on a pathway out of poverty. With an average of five people benefiting from every Trickle Up business, that translates into more than 37,000 lives touched. Their businesses included weaving, food preparation, rice and vegetable farming, goat rearing, fish ponds and selling grains and produce in local markets. They produce and sell goods and services that find a ready market within their villages or nearby towns. Their businesses are humble, but the results are profound. Families eat three meals a day instead of two (or even one), parents can afford to send their children to school, and houses are improved with the addition of a metal roof or concrete floor. Read more about our impact in 2012, here. We are grateful to all of Trickle Up’s friends and donors for helping make our accomplishments possible in 2012 and for supporting us in 2013 as we help thousands more women take the first steps out of poverty. Feel free to contact us, here.